In keeping with the theme of my blog, I decided to start bringing you updates of the newest and greatest bookish addictions in my life so I can share with you some awesomely bookish things or discuss if maybe we share the same bookish loves. It seemed like a great way to get a little discussion going in a very relaxed way. This Edition’s Bookish Addiction? Book Lover’s Coffee! It’s been a while since I’ve posted a new bookish addiction and the time has never been more perfect since today is my first official day as a rep for Book Lover’s Coffee! I absolutely love a good coffee and combine that with books? Instant hit! In full disclosure, I would write this even if I weren’t a rep because I just adore this company and their coffee but I was so lucky to have been chosen to officially share some things and spread the word so that’s just a special bonus! The company is small and awesome, run by shop-owner Shelly out of Michigan. Currently, each bag of coffee is roasted at the time of order, meaning you’ll get the freshest coffee possible! Many bags come as whole bean coffee so you can grind it yourself and keep it even more fresh but you can also request your coffee to be ground if you don’t have a coffee grinder. Book Lover’s Coffee has some amazing flavors and also some amazing fandom representations! My personal favorite that’s a regular in the shop is Book Haul, a vanilla cinnamon flavor! There are also flavors like Salted Caramel, “Darkling Roast” (a dark roast), and Butterbeer! Shelly always has some awesome seasonal flavors and Hearts & Heroes (chocolate amaretto) is a great choice for Valentine’s Day! You can also grab some small, 2oz samplers that I’ve purchased several times for gifts! She also has some AWESOME Stranger Things coffee up for sale right now and I’m already almost done with my bag of Coffee and Contemplation! I love the coffee flavors because the additional flavors aren’t too powerful and you can still taste that rich coffee flavor with every bag. It’s not like drinking a super sugary Starbucks drink (although those hold a different special place in my heart) and I still get that awesome coffee taste with some fun flavor additions! The balances are always great and delicious. The customer service is always fantastic. Shelly is always super quick to reply to any questions I’ve had, the orders ship really quickly, and she’s always super attentive to when I order, sometimes contacting me before my order even ships to let me know it’s heading out! It’s always such a pleasant experience ordering… and of course the coffee is amazing too! So if that’s convinced you — which I hope it has! — I’m repping for Book Lover’s Coffee all February long! I’ll be posting photos of these wonderful products on Instagram all month (even more so than I already do) and you can use my rep code ADDICT10 to save you some money on your purchase! Do you love Book Lover’s Coffee already? Excited to give it a try? If you order, let me know what flavors you’re getting!! This entry was posted in Books, My Latest Bookish Addiction and tagged Book Lover's Coffee, Book Merch, Books, Coffee, My Latest Bookish Addiction on February 1, 2018 by Brittany. My Latest Bookish Addiction  – Audiobooks Give Me Life! This Edition’s Bookish Addiction? Audiobooks… Again… Again! Audiobooks again again? What the heck does that mean? Well, I’ve now posted about audiobooks being a bookish addiction twice now, so this is the third time but seriously. IT’S RELEVANT. I promise. But guess how many were audiobooks? 41. FOURTY-ONE BOOKS OUT OF FIFTY-NINE. That’s 70% audiobooks this year. What would I do without them!? No, seriously, what would I do? I would be listening to music while I work or drive, which is all well and good, but I would have read… 18 books this year? Huh!? That’s insane. Audiobooks give me life. I’ve been sooooo busy with candles that I don’t have time to sit and read. I don’t have to read. Hell, I don’t have time to sit. So I listen to audiobooks while I do most things and THANK GOODNESS FOR THAT. So yes, we’re talking about audiobooks for a third time here on this feature that I give little love to. Because we need to! Instead of rehashing all the wonderful things about audiobooks, let’s skip straight to my favorites from this year! THE HATING GAME by Sally Thorne. AMY AND ROGER’S EPIC DETOUR by Morgan Matson. THE NIGHT CIRCUS by Erin Morgenstern. THE QUEEN’S THIEF SERIES by Megan Whelan Turner. STRANGE THE DREAMER by Laini Taylor. THE SHADES OF MAGIC TRILOGY by V.E. Schwab. Narrated by Steven Crossley (book one), Michael Kramer and Kate Reading (books two/three). And my favorite part of any audiobook, the Audible guy! “Audible hopes you have enjoyed this program.” Don’t you just love him? Of course I can’t let you go without making some recommendations. Last time I just threw out some audiobook recs but I’m digging a little deeper this time — audio beginner or master, there’s something here for everyone! Check out my audiobook list on Goodreads for even MORE recommendations or you can always comment or email me for recs! These are the ones I would start with but I’ve listened to a bunch more than I’ve also enjoyed! What audiobooks do YOU recommend? This entry was posted in Books, My Latest Bookish Addiction and tagged Audio, Audiobook, Audiobooks, Books, My Latest Bookish Addiction on August 30, 2017 by Brittany. This Edition’s Bookish Addiction? Fandom bookmarks! It’s been a while since I’ve done one of these since my latest addictions tend to be the same (audiobooks, The Lunar Chronicles, Instagram, more audiobooks…) but lately I’ve been getting more and more into book-related merch! My shelves are STACKED and I always have too many books to read (seriously, when will I ever get through my TBR!) so I’m not as crazy about adding new books to my shelves as I used to be. I just don’t want so many books to go unread and then money going to waste if I never get to them. Instead, I’ve been putting my allotted book money towards merchandise and fandom-related items! They’re wonderful decorations for my shelves and great props for bookstagram photos, plus they just bring me general joy! Marquis du Soleil | Caitlin creates such beautiful water color bookmarks! There’s such a large variety for so many books and the bookmarks themselves are just wonderful. The paper is high quality, designs are beautiful, and shipping is fast! Skinny Hues | I just ADORE these bookmarks. They were some of the first fandom ones that I purchased and they’re always amazing. They ship from Germany but shipping is cheap since it’s just in an envelope so I usually stock up and buy a few at a time! Marked by Mary | Mary’s bookmarks are gorgeous. They’re handlettered and woodburned. I purchased one and simply love it! Behind the Pages | I love Gina’s unique bookmark design! Her bookmarks ship from Australia so shipping (transit) takes a little bit to get to me in the US but she gets them out the door so quickly and I’m always happy with my purchases! What are your favorite book-inspired bookmarks? Do you have any favorite Etsy (or other) shops? This entry was posted in Books, My Latest Bookish Addiction and tagged Book Merch, Bookmark, Bookmarks, Books, Etsy, Merch, My Latest Bookish Addiction on September 5, 2016 by Brittany. This Edition’s Bookish Addiction? Audiobooks… Again! I’ve already celebrated audiobooks as My Latest Bookish Addiction but I must must share my love for them again. My original post on audiobooks is already over a year and a half old and oh, how things have changed since then! I have a lot more titles to recommend, favorite narrators, and audiobook habits since my original post so the topic bears repeating! Audiobooking has become a way of life for me. In my original post, I was already becoming a seasoned audiobook listener but now I’m at the point where I crave a good audio and I’m always on the hunt for more fantastic stories with amazing narrators! There’s just something an audiobook that really lends that extra “oomph” to a book — there’s another layer of performance being able to hear a narrator voice the characters, put action sequences in motion, and add a general tone to a story. I wouldn’t say that I’m a picky listener but I am choosy. There’s not much that I’ll immediately nix as far as an audiobook option except for a few less-than-thrilling narrators that I’ve run into but I’ve definitely had more amazing experiences than poor. Whether it’s for the better or worse, a narrator can really make or break a book for me. But I’ve also learned that a narrator also can’t save a book for me. Two of my favorite narrators of all time voiced a new book and I swore I could listen to them read the phone book… But I ended up DNFing the audio and returning it to Audible, feeling confident about my decision. I’ll usually finish most audios because I can always speed them up or just listen mindlessly if I’m not thoroughly enjoying. This was one of the rare cases where it just felt like a waste of time. I feel like audiobooks offer a lot of perks for a reader! It may be challenging for some to focus on listening (I know I have to focus sometimes) but if you’re hesitant about trying some, think about this! You can listen to a book while driving, cleaning, cooking dinner, working out, etc. Ever get annoyed that you have to stop reading when you get in the car to go places? Not anymore! I always have an audiobook running so I’ll pop it on during my drive to work, while I’m making dinner, or doing chores. It feels nice that I’m still making progress with a current read. Audiobooks bring a whole new level of performance to a book. Sure, I can do voices in my head… But if anyone talks with an accent, let’s be honest. I try to do it in my head and slowly it just becomes me reading in my own voice again. The voice actors for audios really do a great job giving each character a different voice and most are great at different accents when needed! They also bring heightened emotions, especially in cases like Wil Wheaton’s narration of Ernest Cline’s books! They’re excellent ways to experience your favorite books in new ways. I love re-reading and I often times will pick up the audiobooks of my favorites to experience them in a whole different way! It’s almost always a positive experience and really fun to re-read like that. They bring a more personal connection to the book. I have some favorite narrators that sort of made me fall in love with them — I mean, the characters — a little bit more than I might have just reading the words on the page. Hearing the emotion in a character’s voice or just hearing a character’s voice brings a more personal connection to a story and it tugs on my heartstrings that much more. They can make okay books good or even great. Okay, I’ll be honest. If I had just read ARMADA, I’m not sure I would have loved it. But Wil Wheaton is such a good narrator that he really brought so much to the story and I felt like I was almost watching a movie instead of listening to a book. His enthusiasm is amazing and it really got me into the book when I might have felt some lulls if I had read in print. So what do you think? Any of these reasons convince you to pick up an audiobook? Which ones would you agree with? This entry was posted in Books, My Latest Bookish Addiction and tagged Audio, Audiobook, Audiobooks, Books, My Latest Bookish Addiction on September 25, 2015 by Brittany. This Edition’s Bookish Addiction? Instagram! Instagram isn’t really a bookish thing… but I never used it before I started blogging (I didn’t even know what it was until I saw fellow bloggers posting pictures of books on Instagram) so it’s always been a bookish platform for me! My account is pretty much all books, all the time with some personal pictures thrown in every once in a while. I don’t know why but lately I’ve become a little bit obsessed with posting bookish pictures so Instagram seemed like the perfect topic for My Latest Bookish Addiction! Anyone can be a photographer with a smartphone (again, I’m still not a good one) and I really enjoyed the fact that I could take a quick picture, post it on Instagram, and I avoided all of the steps to email or upload a photo in order to share it! I’m (very) slowly learning how to take better photos and it’s been a lot of fun working on my Instagrams! I spend way too much time setting up and staging pictures but it’s worth it to see the results when they actually turn out well! I mostly just really love sharing pictures of books in any way, shape, or form — new books, according to a theme, recapping the week, what I’m currently reading — and I NEVER get tired of seeing everyone else’s beautiful book pictures! I also love doing book tags on Instagram! Sometimes it’s hard to come up with picture ideas on my own and not get tedious (I’m sure you’re already sick of constant pictures of The Lunar Chronicles and The Grisha Trilogy…) so I love getting tagged to participate in a specific themed hashtag! I think it’s really fun and a great way to keep ideas and pictures flowing! Are you on Instagram? Love bookish photos? Let’s be friends! 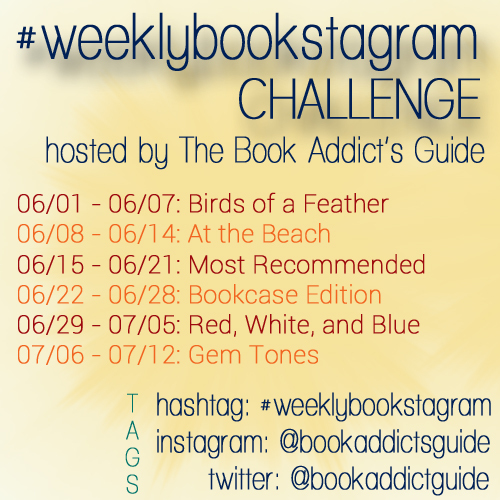 This entry was posted in Books, My Latest Bookish Addiction and tagged #weeklybookstagram, Books, Instagram, My Latest Bookish Addiction, Photo Challenge, Photography on June 1, 2015 by Brittany. This Edition’s Bookish Addiction? Blogger Spotlight Features! Somehow, someway I ended up hopping onto a lot of blogger guest posts and/or Q&A features in March (The Bloggers We Read @ The Things We Read, The ABCs @Andi’s ABCs, Inside & Out @ Bookmark Lit, Book People Talk Movies @ Bring My Books) so I figured what better time and what better way to repay the favor by spreading the word? I really enjoy blogger spotlight features! Naturally, we’re always wanting to get to know books and authors, but I also really enjoy getting to know more about the bloggers behind the posts. I’ve made SO many great friends by being a part of this community and I’m always thankful for the people who helped spread the word about my blog, especially when I was starting out. I really wanted to compile a list of all of the features I could possibly find that showcase other bloggers and their work! We bloggers love spreading the word about books but I think it really creates even more sense of community when we help spread the word about each other! I think it’s a great way to reach a new audience, show support for fellow bloggers, and also get to know someone new yourself. I’ve had a few bloggers sign up for my Book and a Beverage feature that I got to know because of the feature and I’m so grateful that we started to chat! So without further ado, here’s a list of all of the blogger Q&A/guest post features I’ve been able to find so far! If I missed one that you know of, please hop on over to the Google Doc so I can add it to the list! 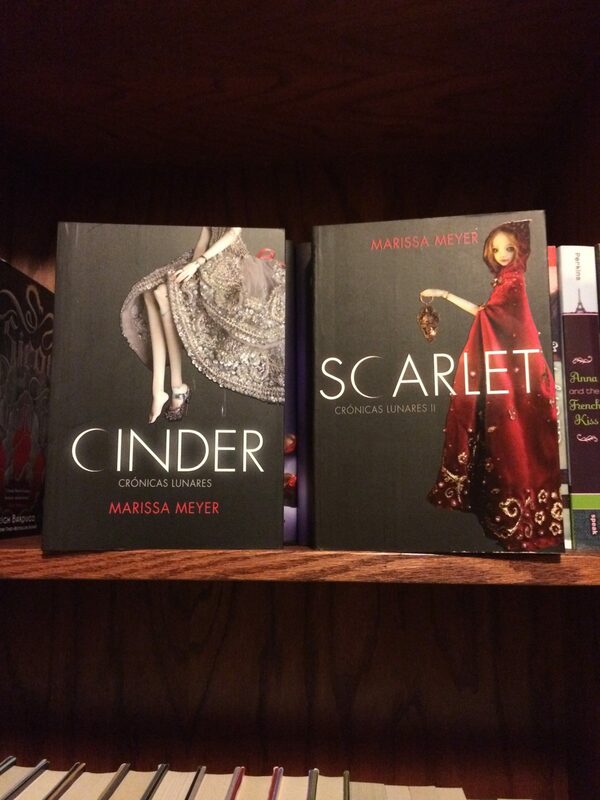 Fangirl Friday | What Sarah Read | Sign-up form on each Fangirl Friday post! Which blogger spotlight features are your favorites? Are there any other blogger Q&A features or guest post features that I’m missing? I’d love to add them to the list! And to see where else The Book Addict’s Guide has been featured, check out a complete list on my About Me page! This entry was posted in Books, My Latest Bookish Addiction and tagged Blogger Guest Post, Blogger interview, Blogger Spotlight, Bookish, Books, Guest Post, Interview, My Latest Bookish Addiction on March 24, 2015 by Brittany. I never EVER used to pre-order. I really didn’t even know this existed (much) until I started blogging and even then, there were never any books I really wanted or needed that badly to order them before they came out in stores. I also never wanted to pay the shipping so there wasn’t much of a need to pre-order if I was only going to pick it up in stores! Somewhere along the way (not to long ago, actually) I started pre-ordering a few books because I knew I would want them anyway… And then somehow the pre-orders became a THING in my typical book buying habits. Shipping. Ah, shipping. It was always my biggest deterrent. Honestly, it still is for online shopping. I can add a little or a lot to my shopping cart, get all the way to checking out, see how much shipping costs, and then totally just dump my order. It used to happen all the time with books, so I would just go to the store when it was convenient. Browsing the bookstore was more fun than shopping online anyway, I told myself. But also… how glorious is it when books show up at your doorstep!? I’m always excited for mail. Amazon Prime is kind of amazing. Two day shipping!? For free!? (Well, virtually free. Obviously you’re already paying for it with the Prime subscription.) I bit the bullet and signed up for a B&N membership too which also features free shipping! I love my local indie, but I can’t ALWAYS afford to buy my hardcovers there so do I a lot of pre-ordering from Amazon and Barnes & Noble! Sometimes — if you’re lucky — the book even arrives a day early. YAY! Of course there are the downsides. I’ve heard some bad stories where people haven’t received their book until a week or more after the pub date (from both Amazon and Barnes & Noble) and sadly it happens to some more than others but I can’t seem to pinpoint whether it happens because of a certain area the book is being delivered to or what book it is or if they’re just totally random incidents. So far all of my pre-orders have gone pretty smoothly! I haven’t gone crazy with pre-ordering all my must-haves because some I just don’t buy right away… But I do have quite a few fall books pre-ordered at the moment! (And the nice thing is, I can pre-order without TECHNICALLY breaking my current book-buying ban because my credit card won’t get charged until the book is shipped! LOOPHOLES.) I do feel like pre-ordering usually helps me get the best price, though, and especially when I have memberships that allow a free shipping option and my closest book store is at least thirty minutes away (which is not TERRIBLE but it’s not really CLOSE and not anywhere near on the way home from work), ordering books online just seems like the most convenient option at the moment! So tell me! Do you pre-order? Was there ever a reason you didn’t pre-order/don’t see the appeal? Do you pre-order from your local indie as well as Amazon and Barnes & Noble? This entry was posted in Books, My Latest Bookish Addiction and tagged Bookish, Books, My Latest Bookish Addiction, Pre-order, Pre-ordering, Shopping on September 9, 2014 by Brittany. I’ve been re-reading a lot of books lately. Before I was a blogger, I re-read books ALL THE TIME. Literally. Those were all of my reads. I was constantly re-reading Harry Potter and sometimes the Twilight saga. I never really paid attention to new books other than what my sister was reading and what my friends were reading from time to time and I barely had half a shelf full of books that I actually owned and kept and those were my re-reads. Since I became a blogger, I obviously haven’t had as much time for re-reads, but I also don’t want to forget all of the books that made me fall in love with reading. Recently I’ve been doing a lot of re-reads, most of them via audio (I even made a previous My Latest Bookish Addiction post on my love of audiobooks!) and I’ve been finding that’s a great way to experience my favorite books in a new way to experience them for a second time. Re-reads have always been really important to me and I’ve been in a few reading slumps lately… Nothing big but sometimes I just end up not feeling my current book and for some reason… it’s been happening a lot lately. What to do, what to do? Pick up a re-read! It all started a while ago when I felt the need to re-read Harry Potter again. It’s probably been… well, YEARS since my last re-read and those books need to be read way more often than that. I had heard good things about the audio so I decided to try them and just love them! I’ve been making my way though the series (Order of the Phoenix up next!) and ever since then I’ve been picking up a LOT more books to re-read (mostly via audio) as well. In the last year, I’ve re-read quite a few books and it’s SUCH a good feeling. It’s so nice to remember what I loved about these books and how they made me feel. It’s so fantastic to spend time with them again and to see different things in them that I didn’t recognize the first time around because I was focused on a different aspect of the book when I first read it. Even re-reading Harry Potter for the umpteenth time, I find something different in each book each time I read them. How I read a book and what I see not only changes because I already know some of the basics and don’t have to focus as much on them, but also my reading styles and interpretations change with age. I’ve read quite a few books for the second (or third… or fourth… or more) time recently and honestly with each re-read, I appreciate the book a little bit more. I might not be as amazed and astonished as I was the first time around but I learn different things about the book that I might not have seen before and I get to spend more time with the characters that I love and the worlds I wish I could experience even more! So tell me! Do you find yourself wanting to re-read some of your favorites? Do time and dedication to other books hold you back? Or do you make the time to spend some time with your favorite books? This entry was posted in Books, Discussion, My Latest Bookish Addiction and tagged Bookish, Books, My Latest Bookish Addiction, Re-read, Re-Reading on July 14, 2014 by Brittany. Way back before I was a blogger (and even after), I wasn’t the kind of person who actually kept books once I was done reading them. I borrowed a lot from my sister, some from the library, and the only books I really bought at full price were ones I was going to keep for sure. Some secondhand books I ended up reading and just selling back to the used bookstore. Nowadays, well… You’ve seen my shelves. They’re filled with all of my favorites and then some. I do go through and pass along or giveaway books that I don’t feel the need to keep, but if I have a favorite, boy, do you bet that book is staying on my shelf and even in multiple formats. Some books I just have in both hardcover and paperback — like when I already had the paperbacks of If I Stay and Where She Went, but purchased the hardcovers when I met Gayle Forman so I could have her sign them. Other books, I’ve basically just started collecting in all forms and any editions I can get my hands on. I’ve purchasing both paperbacks and hardcovers of The Lunar Chronicles and The Grisha Trilogy, but that obsession didn’t start until Macmillan did this cool thing where they had a special page of blogger acknowledgements in the paperback. I mean, how could I NOT purchase a book that my blog’s name is in!? 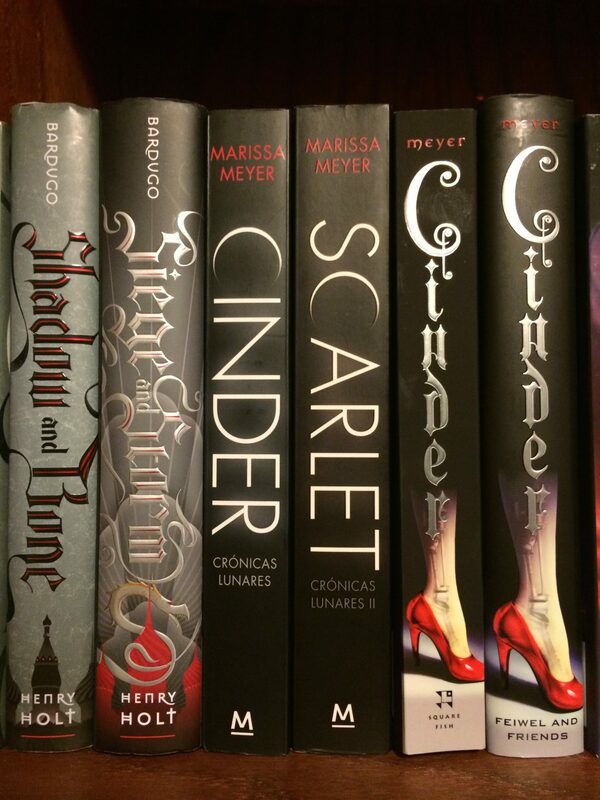 Then my lovely friend Amy from Tripping Over Books bought me the Spanish editions of Cinder and Scarlet for my birthday back in March… And a new obsession flourished. The international editions of this series are so gorgeous and I MUST own them all. There are a few places to go to get some international editions like Fishpond and The Book Depository which ship for free internationally, but they don’t really have a wide selection of international versions. AbeBooks actually has a pretty great selection, but of course, if you want an international edition, you’re going to have to pay more for it! Since AbeBooks is less of a distributor straight from their warehouse and more like Half.com or the area of Amazon where users are able to list and sell their own books. Some sellers offer free shipping, but most of those are for American editions or if they are international, the book itself starts to get costly. I haven’t made any purchases from AbeBooks yet, but I’ve been eyeing these books for a while now, still not ready to let go of my money with all the things I have going on at the moment. I may look into making a purchase soon though! Some International Editions I’m Dying For! Okay, REEEEEEL it in here, B. I could honestly show you each and every international cover I want but this would be ONE LONG POST (like it wasn’t already). NOTEABLE OTHER AWESOME INTERNATIONAL EDITIONS: Tamara Ireland Stone’s Time Between Us has some GORGEOUS international covers! I’ve also seen some really neat ones for Just One Day by Gayle Forman and the international covers of Eleanor & Park by Rainbow Rowell aren’t as snazzy but I love it so much that I’d end up collecting those someday too! So tell me! Do you ever buy international editions of books for your personal collection? Do you have a special source to purchase them? Which ones do you already have in your personal library and which ones are you currently drooling over? I must know! This entry was posted in Books, My Latest Bookish Addiction and tagged Audiobook, Audiobooks, Bookish, Books, My Latest Bookish Addiction on May 23, 2014 by Brittany. I’ve been loving audiobooks for a while now, but I think it’s about time that I gush about the to their fullest extent. I was nervous to try audiobooks when I first tried listening. What if the narrator was awful? What if they couldn’t hold my attention? What if I got bored or annoyed or mad? In all honesty, any one of those is a very real possibility, but that’s why I try to do some good research before picking a new audiobook. Sometimes a breathy narrator ruins the experience for me… On the flip side, a fantastic narrator can totally make the listening experience that much more amazing! I feel that audiobooks should be selected just as carefully as your regular reads. The fact that you’re listening to a book and it’s being read by someone else just throws one more factor into your reading experience. I’ve been trying to pick my reads more carefully nowadays because I’ve finally come to grips with the very sad but real fact that I can never possibly read all of the books I want to… BUT audiobooks do help with that. I’m a multi-book reader. That’s not a term, I know, but what I mean is that I read more than one book at time and audiobooks are a great way for me to read multiple books at once. I always have a physical copy that I’m reading and sometimes I throw in an ebook in there, but recently I’ve started adding a constant stream of audiobooks to the mix. I have a semi-long commute to work so they’re great for the long drives and who would have ever thought I could read while I was driving!? I love being able to read at a time when “traditional” reading isn’t quire possible. Depending on the production of the audio and how engaging the narrator is, I can even picture it as sort of a movie in my mind which is great to keep my attention and to further pull me into the book. Looking for a good audiobook? Here are just a few of my favorites — both for the content of the book and some excellent narrators as well! Ready Player One by Ernest Cline: Ready Player One was one of the earlier audiobooks I listened to and I LOVED it. Wil Wheaton narrated this masterpiece and aside from the great content of the book (sci-fi, dystopia, pop culture of the 80s), the production quality was fantastic! Wil Wheaton does a great job of narrating and I was HIGHLY entertained the entire time. I’ve been itching to re-read this on audio ever since I finished it because it was THAT good. The Scorpio Races by Maggie Steifvater: The audio for this book was amazing. This was the first audio production that I had listened to that incorporated more than one narrator. Since the book alternates between the voices of both Sean and Puck, the narrators alternated chapters as well. Listening to this book was just fantastic and it absolutely enhanced my reading/listening experience! SO many readers have fallen in love with this audiobook and I’m so glad I listening to the suggestions to pick this one up on audio first! The Night Circus by Erin Morgenstern: I was in a YA kick when I started The Night Circus and honestly, I wasn’t 100% sure if it was YA or adult when I first started it because so many of my fellow YA bloggers were raving about it! I turned the audio on and to my surprise, the narrator was Jim Dale! (He also narrates the Harry Potter audiobooks, but I knew his voice as the narrator for Pushing Daisies.) The story was magical and listening to it somehow made it even easier to picture! Everything felt so vivid and like I was right in the action. The Graveyard Book by Neil Gaiman: The Graveyard Book was my first Neil Gaiman book which I selected thanks to the help of Alyssa (a major Gaiman fan) and because I wanted to listen to a good book for Halloween-time. This book was fantastic on audio. Neil Gaiman narrates the book himself and I was utterly swept away on this literary journey. His voice is just perfect for narration and I’ve pretty much made a promise to myself to listen to any of his books that he narrates! If you have the opportunity to listen to Neil Gaiman narrate, I highly recommend it! How do you feel about audiobooks? Is there anything holding you back from trying them? Are they a constant in your life? Do you have any personal favorites? I want to hear it all! This entry was posted in Books, My Latest Bookish Addiction and tagged Audiobook, Audiobooks, Bookish, Books, My Latest Bookish Addiction on March 24, 2014 by Brittany.